For a rapidly-aging population, osteoporosis and susceptibility to debilitating fractures are increasingly urgent clinical problems. Fortunately many nutritional agents act to promote the optimal balance between bone resorption and deposition, and to check mineral losses. Ipriflavone, similar to soy isoflavones, has proven clinically effective in this regard. 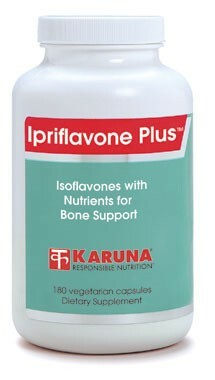 Ipriflavone is compatible and synergistic with other bone-sparing agents. 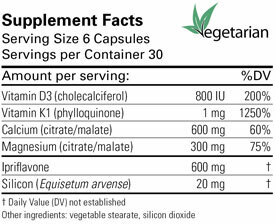 Ipriflavone Plus also contains calcium and magnesium as the preferred citrate/malate salts, generous amounts of both vitamin D3 and vitamin K1, as well as important trace minerals. Refer to About...Calcium , also the About... Vitamin D , Magnesium and Other Bone-related Factors . Extensive basic science and human clinical data on the isoflavone derivative ipriflavone has demonstrated that it is a safe and effective approach for optimizing bone metabolism and supporting healthy bone density alternative to estrogen therapy for increasing bone mass in postmenopausal women (Menopause 1999;6: 233-41; Horm Res 1999;51:178-83; Gynecol Endocrinol 2010;26:76-80). Silicon appears to play important roles in the formation and maintenance of connective tissue and bone (J Bone Miner Res 2004;19:297-307; Magnes Res 1993;6:247-9; Nutr Today 1993;28:13-8).